Getting rid of mold is a different and unique project every time, there is no clear cut single process. The first thing you have to know is that without water the mold spores will not grow, so stopping the water source is always the first thing that needs to be completed. Otherwise, if you clean up the mold but don’t take care of the water source, mold will come back. The other thing to know is that all mold is dangerous and harmful to our health, some more so than others depending on the volume of mold spores in the air. Mold is all around us, every day, and sometimes people don’t realize that. The goal with the mold removal remediation process is to get the mold count down to the levels of the outdoors. 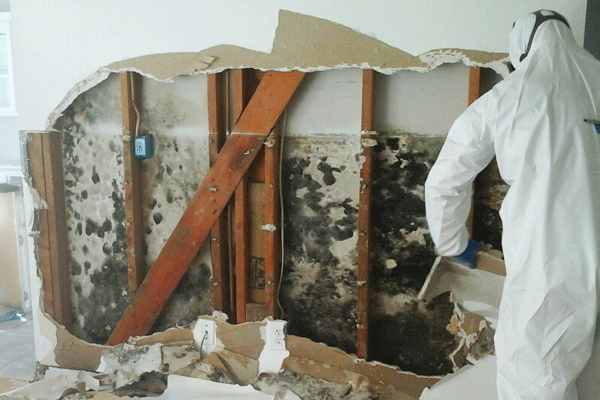 So let’s take a look at what the mold removal process looks like. Air Quality Test – The first step in properly remediating Mold is to get an air quality professional (Industrial Hygienist) to test the affected areas. With the test results, the air quality professional will be capable of writing up a protocol for proper remediation.